Neil Pigot Making Art No.7 Podcast: Questions of Value | Daily Review: Film, stage and music reviews, interviews and more. Daily Review presents actor Neil Pigot’s series of 60 minute podcasts in which he interviews artists from a range of disciplines about making art. 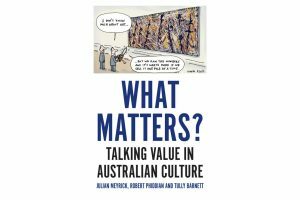 In Episode Seven of Making Art he talks to academic and theatre director Julian Meyrick (co-author of the new book What Matters – Talking Value in Australian Culture) and Mark Williams (author of Falling Through the Gaps – Our Artists’ Health and Welfare). 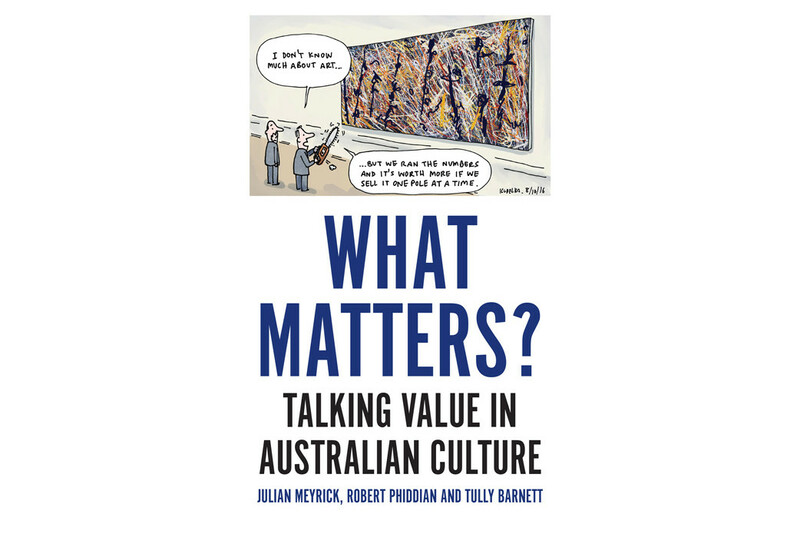 Both their recent publications address the “value” of the arts; how the complexity and meaning of the arts in public discourse has been “reduced to packaged pronouncements about how much it costs, its economic impact and its trickle-down effect’’ and how we value our artists. The speed and apparent complexity of life in the modern world appears to be forcing a number of our time honoured clichés into retirement. “A bird in the hand is worth two in the bush” faces an uncertain future in our fast paced world where the idea of spending time catching birds in bushes is looked upon as just plain silly. And “Too many cooks spoil the broth” is teetering on the brink of extinction in the face of Uber Eats, microwave dinners and a generation of people who look at you with an expression that says “What is a broth anyway?”. In the creative world we like to think we have the greatest of all the clichés, the dog eared and dusty “Art mirrors life”. But beyond the glibness of that particular phrase there lies, as there does with stitches and time, a number of simple truths. For example, it is true to say that when we read a book, look at a picture, watch a play or listen to a piece of music from a particular period we can be, if we choose, transported to that particular time and begin to understand, in a profoundly nuanced way, something of the politics, ideas and social climate that led to its creation. In this way the art in question becomes the mirror through which we gain a wonderfully complex and deeply human insight into the lives of those in our past. Ray Lawler’s great play Summer of the Seventeenth Doll is a classic example. When it was first performed by the Melbourne Theatre Company in 1955 it offered, for the first time, a piece of theatre that was unashamedly Australian. A play that was not only spoken in the Australian vernacular but one that was set in an Australian house populated by Australian people. Not clichés but everyday Australians as we were. Lawler’s The Doll was a fundamental part of a national conversation that resulted in massive social change that saw Australia and Australians define and pursue a very particular cultural imagining for themselves. Prior to The Doll, as it has become affectionately known, Australian plays had largely tended towards the fraudulently British. Strained drawing room comedies or genial, bucolic clunkers that were apologetically small in scope. Plays to be tolerated, curiosities, inferior copies of “real theatre” which came principally from Britain. Lawler’s play represents a seismic shift in Australian theatre that was an expression of, or perhaps a precursor to, a seismic shift in Australian identity. Rather than display a continued acceptance of the notion that we were just British people living a long way from home, Lawler put Australia on stage, not just in the language but also in the exploration of big themes that reflected the reality of an endemically Australian life, ideas that were closer in scope and energy to those explored by Tennessee Williams than they were to reproduction drawing-room comedies. What The Doll reflected was a dramatic change in the way we were coming to see ourselves, a theatrical expression of the birth of a people, an artistic mirror in which we can observe our forebears coming to terms with the notion that they were no longer deferential inhabitants of a far flung British dominion. Instead, they were an independent people living in a different nation with thoughts and ideas about themselves that were their own. And that the play was a critical and box office triumph attested to a growing confidence amongst those people to take hold of those ideas and publically express them. Born out of a connected relationship between a group of artists and the society they inhabited, The Doll was a fundamental part of a national conversation that resulted in massive social change that saw Australia and Australians define and pursue a very particular cultural imagining for themselves that by the mid 1970s had become a vibrant reality. The benefits of arts and culture, once an accepted social good are now the subject of attempts to value it in terms of market reach and beds occupied. This obsession with economic impact and the idea that the measurement of GDP is the only way we can collectively decide whether life is going well has had serious implications for a word that only 30 years ago was something to be discriminated, a term that was the subject of profoundly individual critical judgement. Value. Historically multidimensional, the word value once conjured up an entire universe of thoughts, feelings and meanings but alas over the past so many years it has been stripped of its linguistic richness to the point where in public discourse it speaks of only one thing. Money. And while certain industries and individuals seem comfortable with this reductive language, for the cultural sector and our creatives it has presented a problem when it comes to simply talking about and doing what we do. This is because in practice, art and culture are not principally products or services but instead a series of complex relationships that result in an experience that speaks to who we are, an experience that in turn becomes a part of a conversation about who we want to be. And while it may be publically presented and money is a part of the exchange, the actual transaction is, at the end point, deeply personal, symbolic and individually received and so almost impossible to quantify. An art may affect us deeply or not at all. It may have currency in our life or it may not. It may live to inform us today, in 40 years or never. We may not see it ourselves but feel its effects as a result of someone else seeing it. It is capricious, mercurial, reflective and above all relational and so to attempt to ascribe a singular monetary value to arts or culture is akin to asking what price you want to put on your girlfriend or a sunny day. Yet this reductive concept of value has dominated our national conversations for the best part of 30 years and has resulted in cultural policy that is fanatically obsessed with metrics, of finding ways of proving the economic value or otherwise of art and culture as if they were paperweights, ways of measuring what is largely a qualitative experience in purely quantitative terms. This is despite the acknowledged difficulty of doing so. A difficulty that didn’t escape our politicians notice at a recent meeting of the Australian Council of Cultural Ministers. Despite acknowledging the importance of arts and culture as central to the broader question of knowledge and an admission that the arts and culture are complex, rather than accept that complexity our policy makers seem compelled to revert to the “difficult” question of economic value as if it is some sacred nut to crack, as if complexity was a quality that shouldn’t be celebrated but rather extinguished. Meaning and richness has given way to mathematics and what was once a balanced conversation that centered on why has become one purely focused on how much. The benefits of arts and culture, once an accepted social good and fundamental aspect of our humanity are now the subject of vain attempts to value it solely in terms of market reach and beds occupied. And so if we were to hold a mirror up to our creative industries we would see something that reflects this shoddy thinking. At the high end the scene is dominated, much like our politics, by flabby populism and the repackaging of old ideas presented as new, old ideas without connection to anything other than box office KPIs. And amongst the less fortunate independent artists, long hours and a return to the gift economy all the while encouraged by hollow statements from politicians who talk endlessly about the value of art and artists and how well the sector is performing using rubbery numbers without any concept of what they mean. These are words that led a friend of mine to once surmise that Australia was “not a country of second-rate art but of second-rate ideas about art”. Australia’s performing artists are ageing and facing increasing poverty, poor health, homelessness and depression, with attempted suicide rates more than double the general population. While the numbers around cultural industries may look good, the lives of our creatives are anything but. What Mark’s paper gives us is a narrative that makes it clear that metrics paint only part of any picture. While the numbers around cultural industries may look good, the lives of our creatives are anything but. And it is easy to think as a member of the public that if you pay $80 to see a show at one of our state theatre companies that the actors are doing well but don’t be misled. On any given night if you are sitting in a theatre of 600 people at the Sydney Theatre Company from the stage we may well be looking at $50,000 worth of tickets but if there are six of us in the show you are probably looking at just $1,500 worth of actors. Actors who like all artists live in a gig economy that continues to shrink as our culture, the relationships we have with the ideas of who we are, get placed on an increasingly commercial footing. The choice to commit one’s self to a life of creativity is undeniably a complex and precarious one. You may well ask why bother. Well, we do it because we must. And when we talk about the value of art and culture or why we should support our artists perhaps we need to imagine a world without them. What would the world look like without books, film, theatre, songs, architecture, fashion, painting or sculpture. No Eiffel Tower or Sydney Opera House, no Harry Potter or Hollywood, no Monet’s Water Lilies or Fred Williams’ You Yangs. No wonder, no richness, curiosity, colour or beauty. Nowhere to share our stories. Just numbers. It’s not the kind of world I want to live in. Main image: A scene from Summer of the Seventeenth Doll staged at the State Theatre Company of South Australia in 2015 directed by Geordie Brookman. Photo by Shane Reid.